This the first research point is to look deeper into the following photographers making notes on whether social documentary was their prime focus. Chris Killip is from what I has exclusively published work on social documentary in B&W. There have been areas that whilst document the social times or the day, these are not necessarily for social reform. Most of the images are around the working class of England but he has also been commissioned for book covers and to photograph the Pirelli UKfactory in Burton in 1988. Here though the main subject is not tyres but the workers and families of the factory detailing their lifes. Killip spent much of his career as a Director and Curator for the Side Gallery, Newcastle-upon-Tyne where he spent much of his life. He moved to USA becoming a visiting lecturer and professor at Harvard University 1994-98. Killip is now retired but continues to live in the USA, he is still publishing work of images taken many years ago with a book due for publication in 2018 containing his images of the Punk scene in Newcastle during the late 1970's. Nick Danzziger on the other hand is more varied in his work. He still covers a large element of social reform but also has widened his photo journalism net to include an award winning series on Tony Blair during the Iraq war. As for B&W this is not exclusive has many of his images online are also in colour.
" [ 2001 ] is B&W was award the "Best monochrome illustrated book" by the British Book Design & Production awards in 2002. The images here cover a contrast of the poorer and the richest in our society, almost certainly calling out the social divide. Interestingly though the first image off his website for this work is a black barrister clothed in traditional robes leaving a taxi. Is this a play on the fact that social reform is not just about ethnic background? His images are of exceptional quality and a only taken in B&W. Like Danziger the play on contrasting backgrounds is used to highlight social divide. I found his work interesting on the nudes where nudes and landscapes are sometimes combined. These are not images supporting social reform but more so images of fine art. 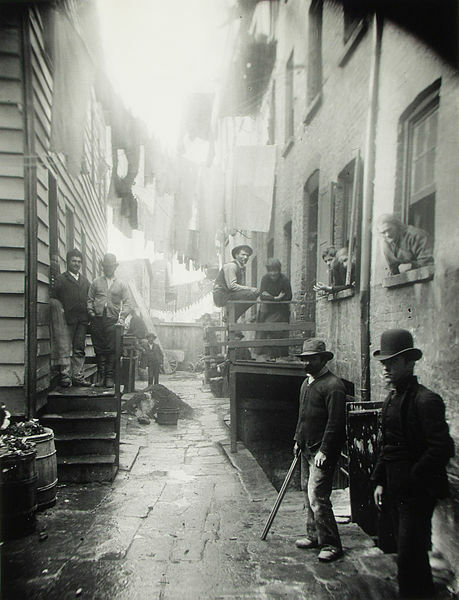 Riis [1849 - 1914] was a Danish-American photographer documenting social reform, especially that of New York City. Many of the areas he wished to photograph were dark conditions and Riis soon became on of the early adopters of flash photography. For this and equipment available I am quite stunned by the images taken. The concept of bringing light to the darkness of a depraved NYC must have been awe inspiring, here an image taken in 1888 of the most crime ridden areas of New York. I will look more into his work. Lewis Hine [1874 - 1940] is described as an American sociologist and photographer, with his work on social reform being instrumental on changing child labour laws in the USA. His photographic life started in 1907 taking images of the steel-making industry. In 1908 he became the photographer for the National Child Labor Committee, leaving his job as a teacher at the Ethical Culture School NY. He continues taking images for 10 years. This was a dangerous time as it was illegal to take such images as they were thought to threaten industry, figures for child mortality were not published, and often the violence would be dispensed by the police. During the war Hine followed the American Red Cross in Europe, and also was commissioned to take images of the construction of the Empire State building. Here he did though make a social statement in his work detailing the precarious positions workers found themselves in.